Sometime before 1935, three parallel streets in Mimico were named after the Hendry family: George Street, Central Street, and Robert Street. 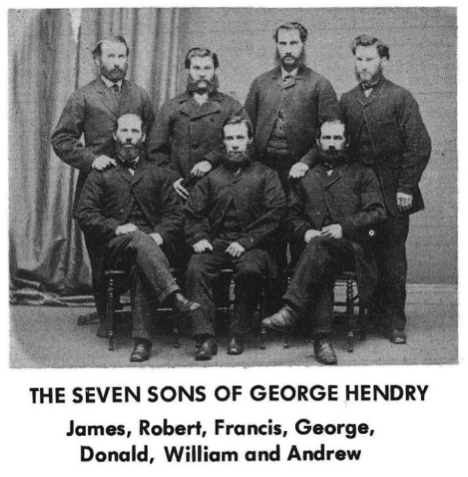 George and Robert were two Hendry sons, and Central Street ran between them up the centre of the Hendry farm. Politicians of the day often discussed eliminating street names like Robert and George that were duplicated within Toronto and its suburbs. Eventually Robert Street was changed to Wheatfield Road. Mysteriously, however, George Street and Central Street survived, even though they each had duplicates within Toronto. 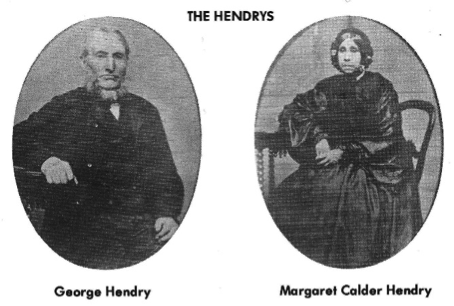 In 1831, George Hendry (1796-1877) married Margaret Calder (1804-1878) in Scotland and they immigrated to Canada that same year. 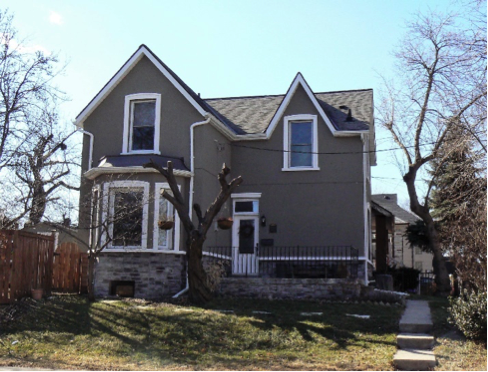 They settled in Montreal initially, and after two years moved to Toronto where they first rented a farm at Hogg’s Hollow and later one on Broadview Avenue. George and Margaret had seven children – all born in Canada and all boys: James in 1832; Robert in 1835; Francis in 1837; George Jr. in 1843; William in 1834; Andrew in 1847; and Donald in 1849. Soon after Donald’s birth, the Hendry’s moved to Mimico and bought a 100 acre farm bound by today’s Royal York Road, Mimico Avenue, Queens Avenue and Lake Shore Blvd. W. The property already included a seven-room, two-storey, pine-log house and multiple barns. ​The Hendry family was active in the Underground Railway. Escaped slaves enroute to Toronto would be welcome to sleep in the Hendry barns and enjoy a warm meal. Some travellers would leave a penny to express their thanks. At least 14 of these pennies have been passed on to subsequent generations of the Hendry family.